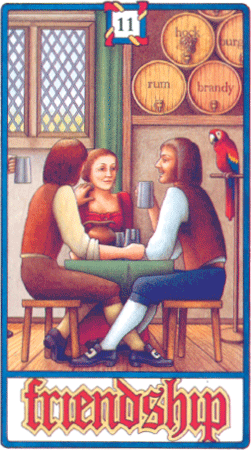 One of the messages of the friendship card is that friendship for most people needs hard work. Some people make friends easily on a superficial level. Others are shy and find it hard to make initial contact. In Jung's categories we are likely to incline to be either outgoing extroverts or reserved introverts. The former find friends come and go; the latter fewer but deeper relationships. Maybe some of the closest bonds are across the two categories where an outgoing person compensates for the unsociable nature of the other and vice versa, and where both benefit from a supportive trading relationship. Friends are a compensation for what we ourselves lack and people make friends at times when they need support.